Here you will learn perfectly about drawing a clear and large round circle on a paper without any compass or any other instrument. All you need is a pencil and paper. This is very easy method that can help you in your education career, drawing or school diagrams. 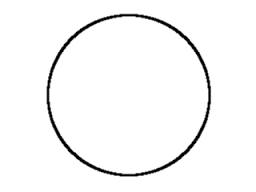 You can draw circle with as easiness as it seems to be in video tutorial. Watch the tutorial step by step and then start your own drawing. Its very easy to be perfect in drawing a round circle. This video tutorial can be followed be beginners and kids as well. This video tutorial is easy as one two three, just act like that and have your hands free and bounded. You can easily do the job. Circle can help in a lot of sketching by the artist. There are a lot of things that needs a circle to be drawn. It makes many other drawings easy. So learn this and draw your one. There are many methods that are also helpful for this. You can also make it perfect round with the help of a ruler. I am sharing another video for this. This another video tutorial may also be helpful for you. Do watch this less then a minute video and have another wonderful idea of drawing a circle. Always try to portray with your imaginations. That is perfect thing that an artist must needed that.